The advanced phases of chronic myeloid leukemia (CML) are known to be more resistant to therapy. This resistance has been associated with the overexpression of ABCB1, which gives rise to the multidrug resistance (MDR) phenomenon. MDR is characterized by resistance to nonrelated drugs, and P-glycoprotein (encoded by ABCB1) has been implicated as the major cause of its emergence. Wnt signaling has been demonstrated to be important in several aspects of CML. Recently, Wnt signaling was linked to ABCB1 regulation through its canonical pathway, which is mediated by β-catenin, in other types of cancer. In this study, we investigated the involvement of the Wnt/β-catenin pathway in the regulation of ABCB1 transcription in CML, as the basal promoter of ABCB1 has several β-catenin binding sites. β-catenin is the mediator of canonical Wnt signaling, which is important for CML progression. In this work we used the K562 cell line and its derived MDR-resistant cell line Lucena (K562/VCR) as CML study models. Real time PCR (RT-qPCR), electrophoretic mobility shift assay (EMSA), chromatin immunoprecipitation (ChIP), flow cytometry (FACS), western blot, immunofluorescence, RNA knockdown (siRNA) and Luciferase reporter approaches were used. β-catenin was present in the protein complex on the basal promoter of ABCB1 in both cell lines in vitro, but its binding was more pronounced in the resistant cell line in vivo. Lucena cells also exhibited higher β-catenin levels compared to its parental cell line. Wnt1 and β-catenin depletion and overexpression of nuclear β-catenin, together with TCF binding sites activation demonstrated that ABCB1 is positively regulated by the canonical pathway of Wnt signaling. These results suggest, for the first time, that the Wnt/β-catenin pathway regulates ABCB1 in CML. Chronic myeloid leukemia (CML) is a myeloproliferative disease characterized by the BCR-ABL constitutive tyrosine kinase (TK) oncoprotein, the result of the balanced reciprocal translocation of chromosomes 9 and 22 (t(9;22)(q34;q11)) . BCR-ABL signaling is responsible for the pathogenesis of CML and is the primary molecular target for disease therapy with imatinib mesylate (Glivec, Gleevec, IM), a TK inhibitor. CML progresses in three phases: an initial phase known as the chronic phase (CP), the accelerated phase (AP) and the blastic crisis (BC) . CML progression to BC has been associated, among others, with the canonical pathway of Wnt signaling. Activation of this pathway leads to nuclear accumulation of β-catenin, which activates the TCF/LEF1 family of transcriptional factors. The canonical pathway plays an important role in CML progression by activating several targets, such as c-MYC, ROK13A, cadherin, MDI1, prickle 1, and FZD2 . Recently, this pathway was demonstrated to be crucial in disease maintenance through the sustenance of CML stem cells [4–6]. Hu and colleagues indicated that β-catenin is essential for the survival and self-renewal of CML stem cells even in mice subjected to kinase inhibition therapy . Mechanisms surrounding the response to IM therapy in CML have been mostly associated with BCR-ABL oncoprotein mutations and BCR-ABL amplification. Nevertheless, some patients do not present either mechanism or respond to therapy, suggesting other mechanisms, the so-called BCR-ABL-independent mechanisms. Among them is the multidrug resistance (MDR) phenotype that is dependent on the expression of proteins that function as extrusive pumps [8–10]. In leukemia, the product of ABCB1, P-glycoprotein (Pgp), is most commonly implicated in the development of drug resistance. It is known that ABCB1 can be regulated by several pathways in different conditions and that there is redundancy in this regulation . However, despite the complex pattern of the ABCB1 promoter region, the existence of seven TCF/LEF1 consensus binding sites on the basal promoter of this gene  indicates the possibility of ABCB1 regulation by the canonical Wnt pathway. Indeed, Yamada and colleagues , Flahaut and colleagues  and Bourguignon and colleagues  revealed the involvement of the Wnt/β-catenin pathway in ABCB1 regulation in early colorectal cancer, neuroblastoma and breast cancer, respectively. Regarding CML, studies with patients have shown that polymorphisms of the ABCB1 gene can alter the response to therapy [16–21]. A few works have confirmed that ABCB1 can be overexpressed in the AP of disease [22–26], and IM-resistant cell lines also overexpress ABCB1[27–29]. Our previously work have demonstrated that MDR cell line Lucena, which over-expresses ABCB1 (800-fold increase) and Pgp (45-fold increase) is cross-resistant to IM and IM-resistant patients present ABCB1 over-expressed, despite of disease phase . Therefore, the aim of this work was to investigate the involvement of the WNT/β-catenin pathway in the regulation of ABCB1 transcription in CML. Our results provide unprecedented information regarding ABCB1 regulation in CML. Lucena (K562 multidrug-resistant cell line induced by vincristine (VCR)) cells overexpressing ABCB1 were kindly provided by Dra. Vivian Rumjanek (Departamento de Bioquímica Médica, Universidade Federal do Rio de Janeiro, Brazil) . The human myelogenous leukemia cell line (K562) and its vincristine-resistant derivative, the Lucena cell line, were grown in RPMI 1640 medium (Invitrogen) supplemented with 10% FBS (Invitrogen), 50 units/mL penicillin G (Invitrogen), 50 μg/L streptomycin (Invitrogen) and 2 mM l-glutamine (Invitrogen) at 37 °C in a humidified atmosphere containing 5% CO2. Lucena medium was supplemented with 60 nM VCR (Sigma). Syntheses of double-stranded oligonucleotides for the seven TCF sites in the ABCB1 sequence from the upstream promoter followed the protocols of Labialle and colleagues see reference . They were named S1 to S7, with S7 being the shortest distance from the coding sequence. TCF sites are distributed throughout the ABCB1 promoter, with S1 and S2 being distal sites. For supershift analysis of the ABCB1 promoter, protein extracts were incubated for 2 h with 1 μg of the anti-β-catenin (Sigma) and anti-Smad8 (Santa Cruz Technologies) antibodies at 4 °C before the addition of the probe. Anti-Smad8 was used as a negative control. Chromatin from K562 and Lucena cells was fractionated by incubation of purified nuclei with micrococcal nuclease and its immunoprecipitation with anti-β-catenin antibody was performed as described previously . DNA extractions from bound fractions were performed following the Abcam protocol. The immunoprecipitated DNA was amplified for sequences containing binding sites by using the following ABCB1 promoter sequence primers: ABCB1p (F) 5′-CAACTCGTCAAAGGAATTAT-3′ and ABCB1p (R) 5′-TTGTACCTTTGATCAACACC-3′. Quantification was evaluated by RT-qPCR analysis. Immunoprecipitation of Protein A (Santa Cruz Technologies) was used for non-specific binding, and Smad8 (Santa Cruz Technologies) was used as a positive control. Analysis of ABCB1 WNT1 β-catenin and β-ACTIN mRNA levels was performed by RT-qPCR. Two micrograms of Trizol (Invitrogen) extracted RNA from cell lines was treat with DNAse Amplification Grade I (Invitrogen) and reverse-transcribed with Superscript II Reverse Transcriptase® (Invitrogen). cDNAs dilutions (1:100) were mixed with SYBR Green PCR Master Mix® (Applied Biosystems) and the following primers: ABCB1: (F) 5′-CCC ATC ATT GCA ATA GCA GG-3′ and (R) 5′-GTT CAA ACT TCT GCT CCT GA-3′; WNT1: (F) 5′-TGG TTT GCA AAG ACC ACC TCC A-3′, and (R) 5′-TGA TTC CAG GAG GCA AAC GCA T-3′; β-CATENIN: (F) 5´-AAG ACA TCA CTG AGC CTG CCAT-3´ and (R) 5´-CGA TTT GCG GGA CAA AGG GCA A-3´; β-ACTIN: (F) 5′-ACC TGA GAA CTC CAC TAC CCT-3′ and (R) 5′-GGT CCC ACC CAT GTT CCA G-3′. RT-qPCR was performed in a Rotor Gene 6000 thermocycler (Corbett) with 50 cycles of 20 s at 95 °C, 30 s at 60 °C and 30 s at 72 °C. For each sample, the expression of target genes was normalized to β-actin mRNA levels. Changes in the mRNA levels of genes were evaluated . 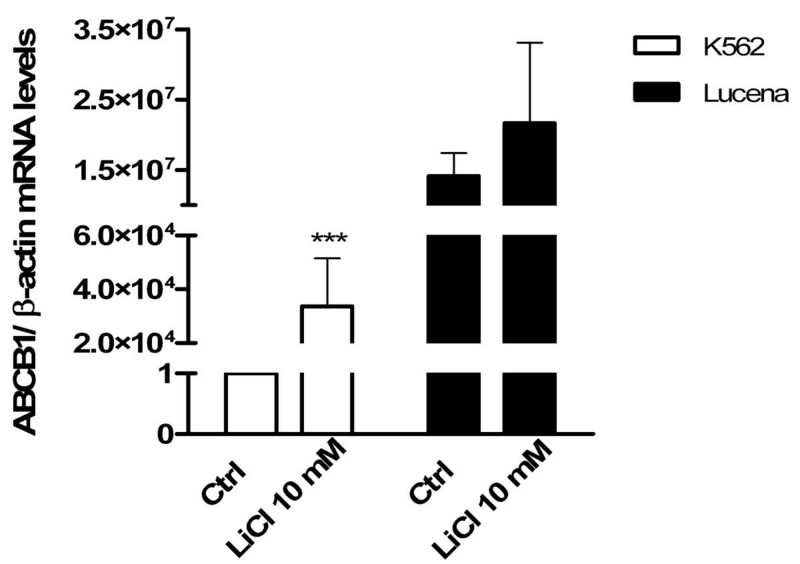 Cell cultures were exposed to 10 mM LiCl . Treatment was performed in 12-well culture plates for 24 and 48 h at a cellular density of 2.0 × 105 cells/mL. The toxicity of the assay was evaluated by FACS analysis, and ABCB1 mRNA levels were analyzed by RT-qPCR. Viability was evaluated via the analysis of propidium iodide (PI) staining (Sigma-Aldrich). Briefly, K562 and Lucena cells (approximately 3.0 x 105 cells) treated with 10 mM LiCl (24 h and 48 h) were harvested and washed in 500 μL of PBS. PI (1.5 μg/mL) was added to the incubated tubes prior to FACS analysis. PI(−) cells were considered viable. All procedures were performed according to the manufacturer’s protocol. For β-catenin expression detection, cells were harvested (approximately 2.5 x 105 cells) and fixed with PBS/1% Formol. As follow, they were permeabilized with 0.5% Tween 20 to allow intracellular staining and labeled with anti-β-catenin polyclonal antibody (Sigma). Results are expressed as mean relative fluorescence intensity (MRFI), which was calculated by subtracting the mean fluorescence intensity (MFI) for specific antibody by the MFI of the respective secondary antibody (which served as negative isotype control). Ten thousand events were analyzed for each sample in a FACSCalibur Flow Cytometer (Becton Dickinson). The data were analyzed using CellQuest v.3.1 software (Becton Dickinson). All experiments were performed in triplicate. All RNA oligonucleotides described in this study were synthesized and purified using high-performance liquid chromatography at Integrated DNA Technologies (Coralville), and the duplex sequences are available upon request. siRNA and transfections were performed following the manufacturer’s protocols of the TriFECTa Dicer-Substrate RNAi kit (Integrated DNA Technologies) and the Trifectin reagent (Integrated DNA Technologies). K562 and Lucena cells (5.5 × 104 cells per well) were split in 24-well plates at 60% confluence in RPMI medium 1 day prior to transfection. The TriFECTa kit contains control sequences for RNAi experiments, including a fluorescently labeled transfection control duplex and a scrambled universal negative control RNA duplex that is absent in human, mouse and rat genomes. Fluorescence microscopy was used to monitor the transfection efficiency according to the manufacturer’s recommendations. Only experiments in which transfection efficiencies were ≥ 80% were evaluated. mRNA levels were measured 48 h after transfection. Duplexes were evaluated at 10 nM. All transfections were minimally performed in duplicate, and the data were averaged. Wnt1 and β-Catenin depletion and RT-qPCR analyses were performed as described above. Cell lysates from K562 and Lucena cells (control - untreated - and treated with LiCl 10 mM) were run on 15% sodium dodecyl sulfate-polyacrylamide gels (SDS-PAGE), transferred to nitrocellulose membranes (Bioead) and incubated with β-catenin (Santa Cruz Technologies), P-GSK3α/β (Cell signaling) and α-tubulin (Sigma) antibodies. Antibody binding was detected using enhanced chemiluminescence ECL Plus Western Blotting detection Reagents (GE). Cytospin preparations of K562 and Lucena cells were fixed with methanol, permeabilized with 0.2% triton X-100 PBS, and incubated for 1 h at room temperature with 1% bovine serum albumin (BSA) and 2.0% FBS blocking buffer under shaking. Slides were rinsed once with PBS and 0.05% Tween 20 and then incubated with appropriately diluted primary antibodies in PBS. Cells were incubated with anti-β-catenin polyclonal antibody (Sigma) overnight at 4 °C. After incubation, the slides were rinsed three times and incubated with Alexa® 546 conjugated anti-rabbit IgG (Molecular Probes) for 1 h at room temperature. Sections from each sample were incubated with secondary antibody and served as negative isotype control. The slides were rinsed three times, air-dried and mounted in an antifading medium containing 4',6-diamidino-2-phenylindole (DAPI) (Vector Labs). Expression and localization of the proteins were observed with a Leica TCS-SP5 AOBS confocal laser scanning microscope (Leica), for capturing representative images of each sample. The ABCB1 reporter constructs were synthesized by Gene Art (Germany) and cloned into the firefly pGL3-Basic vector (Promega) upstream of the Luciferase reporter gene. The constructs named pGL3α, containing just the basal promoter (−1019/+1); pGL3β, containing the basal promoter and one TCF binding site (−1067/+1) and pGL3γ, containing the basal promoter and three TCF binding sites (−3187/+1) were inserted into KpnI and BgLII restriction sites of pGL3-basic. For the transient assays, 1.0 x 105 cells from both cell lines (with or without LiCl 10 mM treatment) were co-transfected using Lipofectamine LTX 2000 (Invitrogen) with 1 μg of each Luciferase construct and 100 ng of pRL-SV40 vector (Promega), according to the manufacturer’s instructions. Firefly and Renilla Luciferase activities were measured in cell lysates 48 hours after transfection using the DualGlo Luciferase Assay System (Promega) on a Veritas TM Microplate Luminometer (Turner Biosystems), following the manufacturer’s protocol. All experiments were performed in triplicate. Ratios of Renilla luciferase readings to firefly luciferase readings were taken for each experiment and triplicates were averaged. The average values of the tested constructs were normalized to the activity of the empty pGL3-basic vector, which was arbitrarily set at value 1. Comparison between K562 and Lucena results from different assays was performed by an unpaired t-test. P- Values less than 0.05 were considered as statistically significant (*p < 0.05,**p < 0.01, and ***p < 0.001). Statistical analyses and graphical representations were performed using GraphPad Prism™ software (GraphPad). Protein binding to the seven oligonucleotides containing TCF consensus binding sites (S1, S2, S3, S4, S5, S6 and S7) was determined by EMSA (see additional file 1 for all EMSAs for TCF binding sites). We also performed competition assays to verify whether protein complex binding was specific for the TCF consensus binding site. Competition analyses using a 200-fold excess of unlabeled S4, S5 and Opt oligonucleotides demonstrated that the specific binding was reduced (Figure1). In addition, we investigated the presence of β-catenin in the protein complexes formed at the TCF consensus binding site in both S4 and S5 oligonucleotides as these TCF binding sites showed the clearer and stronger signal in EMSA analysis. Supershift assays were performed using human β-catenin antibody, and these assays demonstrated that β-catenin was present in the protein complexes (Figure1). These results suggest that the TCF consensus binding site is important for the formation of a protein complex. The appearance of a shifted band in the supershift assay with both the S4 and S5 oligonucleotides ensures the presence of β-catenin among protein complexes binding at the ABCB1 promoter. 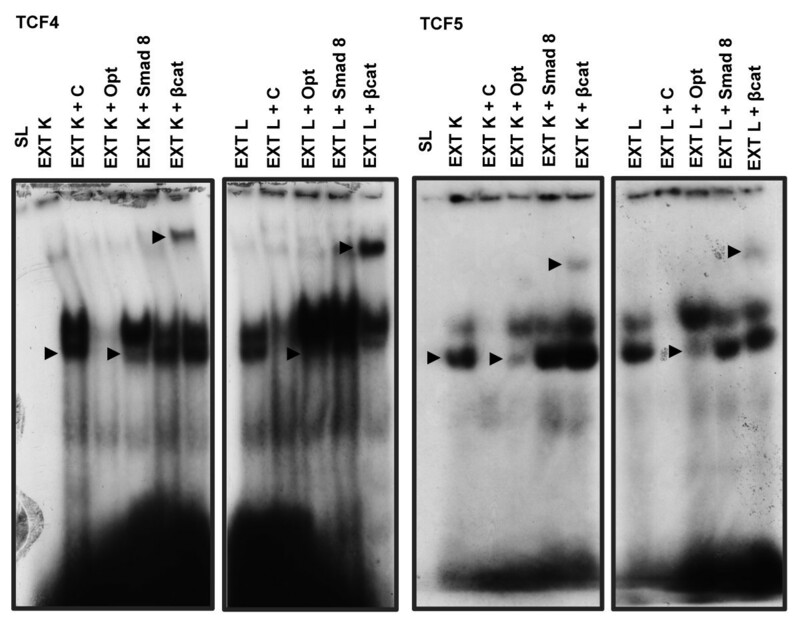 EMSA using oligonucleotides of different TCF consensus binding sites in the ABCB1 promoter and protein extracts from K562 and Lucena cells. EMSAs to verify specific binding using the S4 and S5 oligonucleotides and protein extracts from K562 and Lucena cells. The specificity of the DNA-protein complex is demonstrated by competition reactions with 200-fold excess unlabeled oligonucleotide and by supershift assays. SL – Migration of the probe alone. “+C”- Competition reactions with 200-fold excess unlabeled probe. “+Opt” – Competition reactions with 200-fold excess unlabeled wild-type oligonucleotide for the TCF consensus binding site. EXT K – protein extract from K562 cells. EXT L – protein extract from Lucena cells. “+Smad 8”– Supershift reactions using Smad8 antibody. . “+ βcat” – Supershift reactions using β-catenin antibody. The arrows show specific binding. To confirm the EMSA results, we performed ChIP assays. The ChIP assay allows in vivo analysis of nuclear protein-DNA interactions. Chromatin fractions bound to the β-catenin antibody in K562 and Lucena cells were quantified by RT-qPCR using primers to amplify the promoter region that contains TCF binding sites. A 2-fold increase in β-catenin binding was verified in Lucena cells compared to that in K562 cells after normalization with unspecific binding of protein A (Figure2A). Qualitative analysis of ABCB1 promoter amplification is shown in Figure2B. ChIP assay for in vivo quantification of β-catenin binding to the ABCB1 promoter. (A) RT-qPCR quantification of β-catenin binding in K562 and Lucena cells. DNA amplification was quantified in bound and unbound fractions after normalization with protein A unspecific amplification. Normalized fractions were used to calculate the bound/input ratio. (B) Representative agarose gel - qualitative analysis – of ABCB1 promoter amplification for β-catenin ChIP assay. Input: bound and unbound fractions; B: bound; UB: unbound. In order to investigate if the more pronounced bind observed in ChIP assay was due to different β-catenin expression between cell lines, we evaluated its expression by RT-qPCR, western blot, flow cytometry and immunofluorescence assays (Figure3 and Figure4). 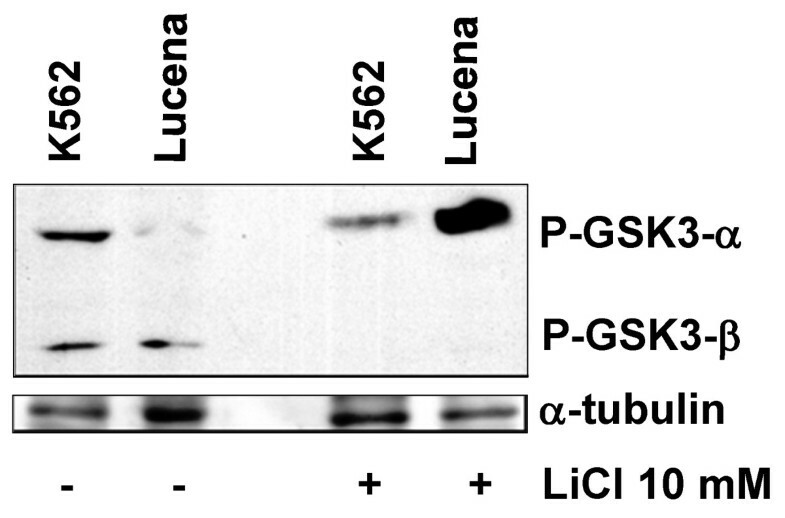 The results show a higher expression of β-catenin in Lucena cell line. β-catenin expression levels in K562 and Lucena cells. (A) RT-qPCR analysis of β-catenin mRNA levels. Raw expression values were normalized to β-actin expression. (B) β-catenin expression by FACS, represented as MRFI. Secondary antibody was used as isotype antibody control. (C) Representative western blot analysis of β-catenin expression. 50 μg of protein extracts from both cell lines were separated SDS-PAGE and probed with anti- β-catenin antibody. α-tubulin was used for constitutive expression. Values represent the means of three independent determinations ± s.d. Distribution of β-catenin in K562 and Lucena cells. 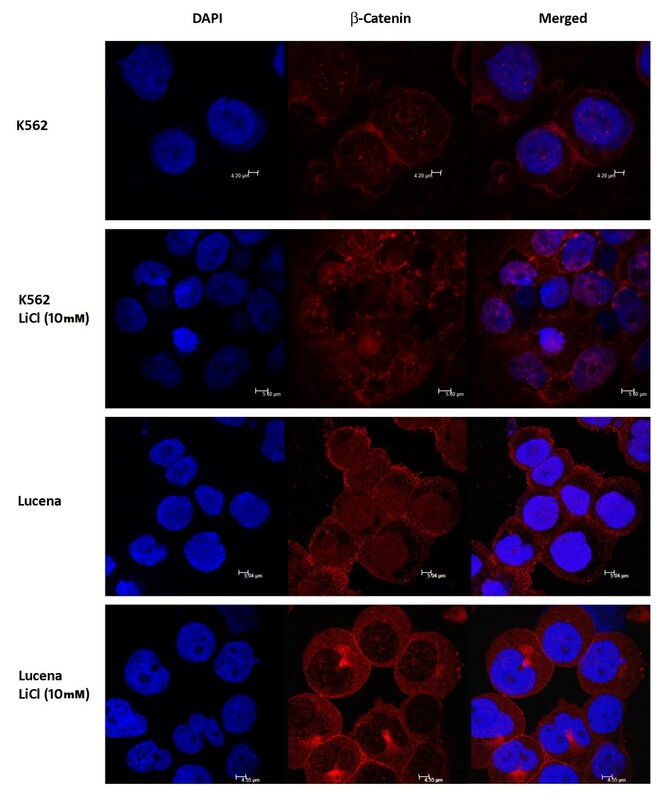 Confocal microscopy of cytospin preparations showing the relative nuclear, membrane and cytoplasmic distribution of β-catenin in K562 and Lucena cells exposed to LiCl 10 mM treatment for 24 h. Nuclei β-catenin density significantly increases upon treatment, compared to untreated cells. Nuclei are stained with DAPI (blue). Micrograph panel is representative of three experiments for each condition. To verify whether the binding of β-catenin to the ABCB1 promoter could lead to ABCB1 transcriptional activation, we activated the canonical WNT pathway in K562 and Lucena cells by LiCl 10 mM treatment, as described by Stambolic and colleagues see reference . 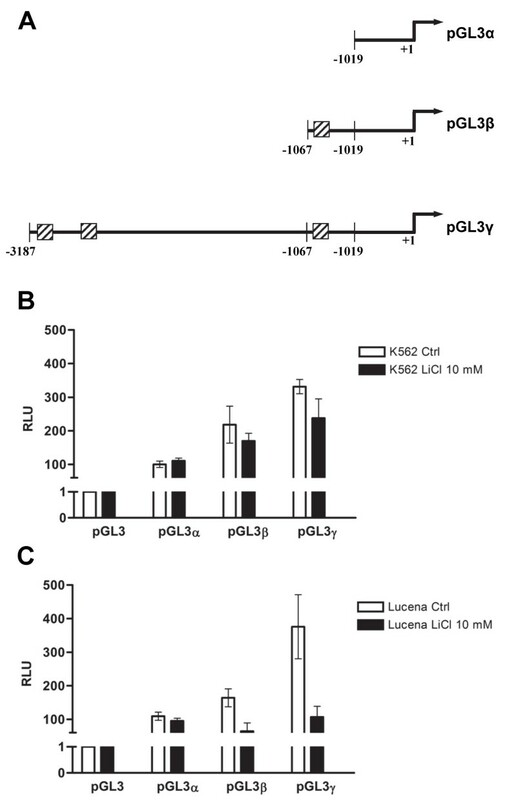 LiCl inhibits GSK3-β, resulting in β-catenin stabilization and its consequent nuclear translocation. This treatment is currently used for this purpose in the literature . 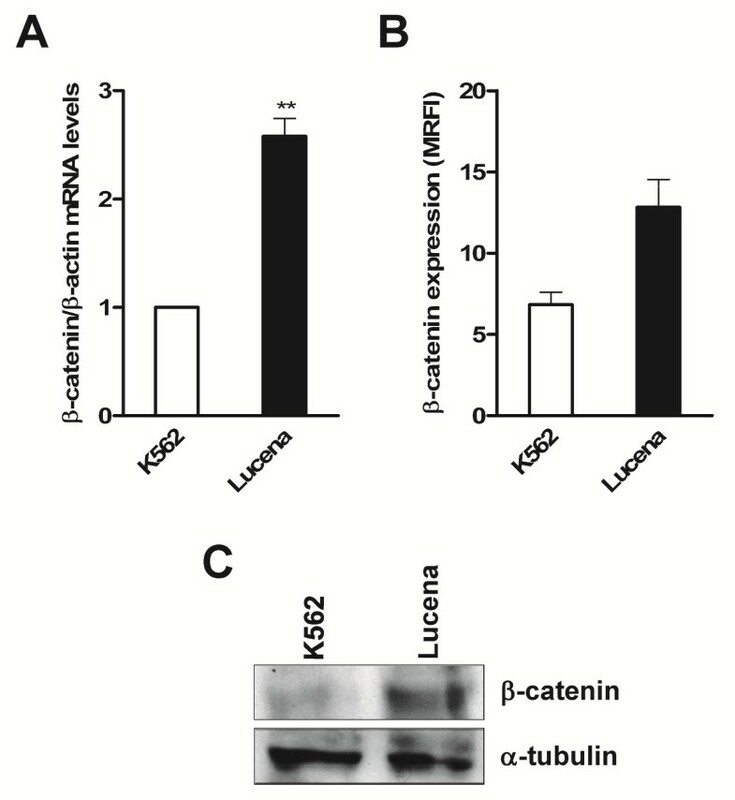 The nuclear translocation of β-catenin was more pronounced in K562 cell line than in Lucena cell line (Figure4). Moreover after LiCl treatment we demonstrated that phosphorylated GSK3-β was abolished in both cell lines (Figure5) indicating that degradation of β-catenin was prevented, enhancing its nuclear translocation (Figure5). Western Blot analysis of GSK3 activation. Representative western blot analysis of P-GSK3 from both cell lines protein extracts, with or without LiCl 10 mM treatment. 50 μg of protein extracts were separated SDS-PAGE and probed with anti-P-GSK3 antibody. α-tubulin was used for constitutive expression. For each treatment results, representative of three independent experiments are shown. We examined cell viability by FACS analysis prior to RNA extraction (data not shown). As LiCl treatment did not alter cell viability, we evaluated ABCB1 mRNA levels in K562 and Lucena cells treated with LiCl 10 mM by RT-qPCR analysis at 24 h. Untreated cells were used as a control. 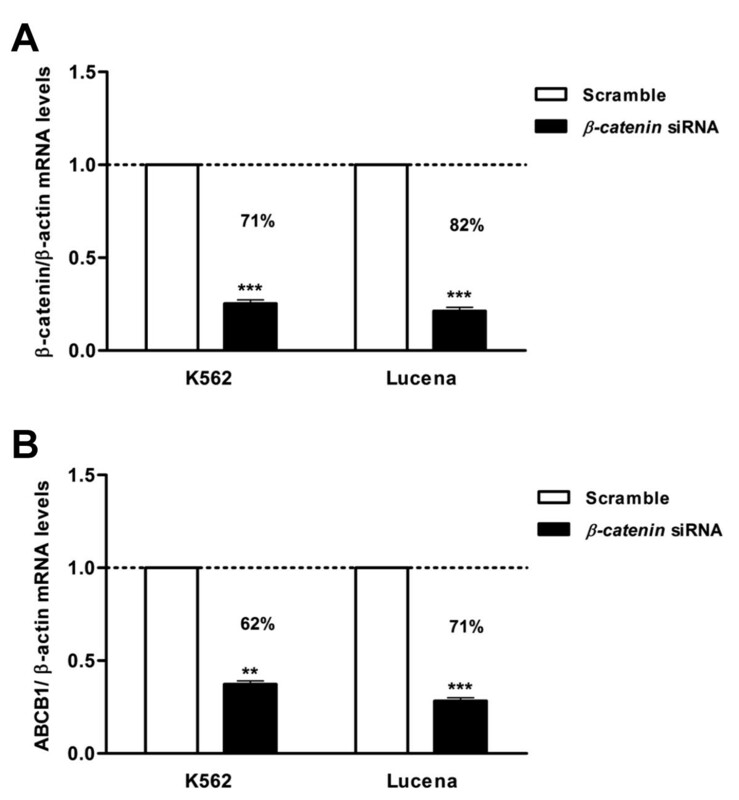 The increase in ABCB1 mRNA levels was more significant in K562 cells than in Lucena cells (Figure6). Wnt/β-catenin pathway activation increases ABCB1 expression. Increases in ABCB1 mRNA levels were evaluated after LiCl 10 mM treatment for 24 h. Total RNA was isolated and used in RT-qPCR to determine changes in ABCB1 mRNA levels after normalization to β-actin expression. Values represent the means of three independent determinations ± s.d. To strengthen our observations, we performed functional analyses of WNT1 and β-catenin depletion in K562 and Lucena cell lines using RT-qPCR. Using a siRNA approach after 48 h of transfection, a reduction in WNT1 expression of more than 85% and β-catenin of more than70% were achieved in both cell lines when compared to scrambled control sequence-treated cells (Figure7A and 8A). Thus, we used these samples to evaluate ABCB1 mRNA levels to verify how the Wnt pathway could be involved in ABCB1 regulation. WNT1 depletion in Lucena cells resulted in an 80% reduction in ABCB1 expression (Figure7B). Despite the 85% reduction of WNT1 expression in siRNA-treated K562 cells, we did not find evidence of significant reductions in ABCB1 mRNA levels compared to the levels in scramble control-treated cells, suggesting that probably other Wnt ligands could play a role in this activation (Figure7B). Expression of ABCB1 mRNA levels after Wnt1 depletion in CML cell lines. 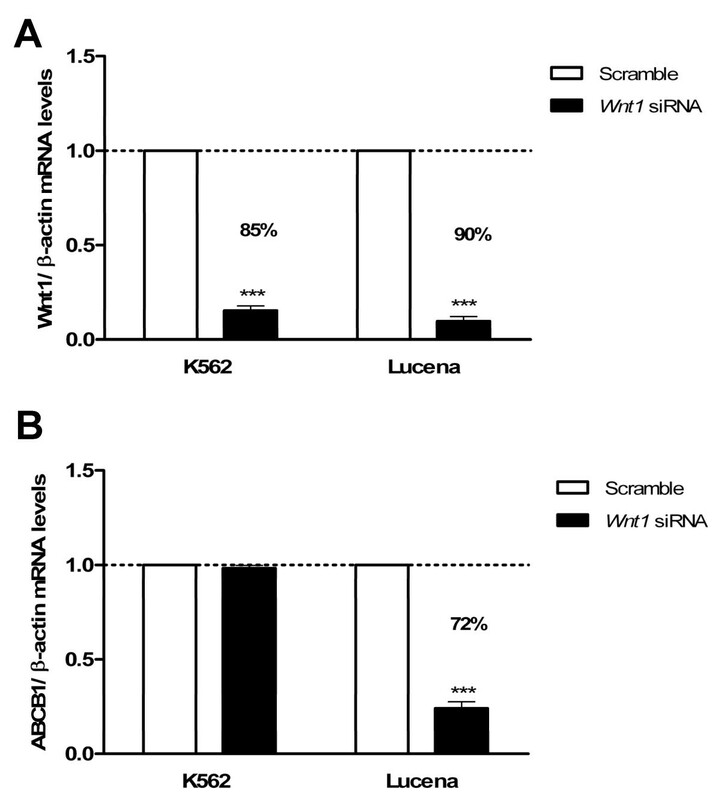 (A) WNT1 siRNA in K562 and Lucena cells. (B) Analysis of ABCB1 mRNA levels after Wnt1 depletion. Total RNA was isolated and used in RT-qPCR analysis to determine changes in ABCB1 mRNA levels after normalization to β-actin expression. All data were presented as fold inductions relative to control group expression (scrambled). Values represent the means of three independent determinations ± s.d. Expression of ABCB1 mRNA levels after β-catenin depletion in CML cell lines. (A) β-catenin siRNA in K562 and Lucena cells. (B) Analysis of ABCB1 mRNA levels after β-catenin depletion. Total RNA was isolated and used in RT-qPCR analysis to determine changes in ABCB1 mRNA levels after normalization to β-actin expression. All data were presented as fold inductions relative to control group expression (scrambled). Values represent the means of three independent determinations ± s.d. However β-catenin reduction in both cell lines confirmed that indeed the canonical WNT pathway regulates ABCB1 expression as shown by 60% and 71% reduction of ABCB1 mRNA levels in K562 and Lucena cells respectively (Figure8B). To further evaluate the relative contribution of TCF transcription factor to the regulation of ABCB1 promoter activity, we performed transient transfection assays using K562 and Lucena cells with constructions containing TCF binding sites (Figure9A). These constructions were transfected with or without LiCl 10 mM and Luciferase activity was measured using Luciferase assay approach. ABCB1 promoter TCF binding sites transcription activity using reporter plasmid pGL3 basic. (A) Scheme of constructs with TCF binding sites. (B) Luciferase activity reporter assay in K562 cells with or without LiCl 10 mM for 24 h. (C) Luciferase activity reporter assay in Lucena cells with or without LiCl 10 mM for 24 h. All luciferase assay results expressed as relative light units (RLU). These results showed that Luciferase activity increases in the presence of TCF binding site in both K562 and Lucena cell lines (Figure9B, 9C). Even with only one TCF binding site-pGL3β construct transfection, we observed a higher Luciferase activity compared with basal promoter without TCF binding sites. The Luciferase activity increases with constructions with more than one TCF binding sites (Figure9B, 9C). In K562 and Lucena cells treated with LiCl we observed a reduction in the Luciferase activity when compared with the untreated cells. As LiCl treatment results in the translocation of β-catenin to the nucleus this reduction reflects the lack of cytoplasmatic β-catenin necessary to activate TCF binding sites in the constructs that are in the cytoplasm. Resistance to chemotherapy is a recurrent issue in all cancer types. Because CML has the propensity to evolve from the CP to the AP and BC, with different responses to targeted therapy such as TK inhibitors, the molecular understanding of the mechanism of resistance in this neoplasia is advancing rapidly. IM was the first molecularly targeted therapy rationally designed to specifically inhibit BCR-ABL TK activity . However, despite the effectiveness and good tolerability of IM, drug resistance does emerge. Although a hematological response is observed in over 95% of CP patients, primary resistant can occur . Otherwise, AP patients initially respond to IM but inevitably relapse with treatment-refractory disease because they acquire other mutations in addition to BCR-ABL amplification or kinase domain mutations [40–42]. Since the demonstration that IM could be extruded from CML cells through Pgp action [43, 44], ABCB1 has become an interesting subject in IM resistance studies. Our previous results indicated that ABCB1 is overexpressed in CML patients with intrinsic and acquired resistance to IM therapy compared to its expression in IM-responsive patients and healthy bone marrow donors see reference . This finding contrasts the idea that only individuals in the BC stage can exhibit ABCB1 overexpression, as suggested in the literature. Even though we have analyzed a small cohort of patients, our results corroborate those of Vasconcelos and colleagues see reference , ratifying the importance of ABCB1/Pgp in CML. Interestingly, in CML, Jamieson and colleagues demonstrated that the granulocyte-macrophage progenitor pools from patients in BC and IM-resistant patients exhibited elevated levels of nuclear β-catenin compared with those in granulocyte-macrophage progenitors from healthy donors. Moreover, these progenitors acquired self-renewal ability . These data indicated the important role of the Wnt/β-catenin pathway in the self-renewal of CML progenitors and the acquisition of resistance. Wnt signaling involvement in TK inhibitor resistance was also demonstrated through its noncanonical pathway by Gregory and colleagues . Their results indicated that Wnt/Ca2+/NFAT signaling maintains the survival of Ph+ leukemic cells under BCR-ABL inhibition. Altogether, we can speculate that the deregulation of Wnt signaling leads to key modifications in the biology of cells, allowing them to become intrinsically more resistant to drug therapy. However, a link between TK inhibitor resistance, Wnt signaling and drug efflux mechanisms such as MDR has never been considered. Despite some recent findings demonstrating that TCF consensus sites for β-catenin were functional in the ABCB1 promoter in other types of cancer, in CML, this regulation has not yet been investigated. In this work, using MDR (overexpressing ABCB1) and non-MDR cell lines (Lucena and K562, respectively) as models of CML, we demonstrated through EMSA and ChIP analyses that β-catenin binds to the TCF/LEF consensus binding site in the ABCB1 promoter. RT-qPCR analyses indicated that this binding occurred at 2-fold higher levels in Lucena cells than in K562 cells. As it has been demonstrated that the BCR-ABL protein can establish β-catenin expression in CML via TK-mediated phosphorylation , this finding suggests that in drug resistance in CML, the canonical Wnt pathway could be more strongly activated to positively regulate ABCB1 transcription, as previously evidenced in other types of cancer. Interestingly we could demonstrate by RT-qPCR, western blot and FACS, β-catenin higher expression in the MDR cell line. Furthermore, it is known that BCR is a negative regulator of the Wnt/β-catenin pathway. The fusion gene BCR-ABL formed in CML decreases BCR transcription and BCR translation, and thus, there is no more BCR available to complex with β-catenin, leading to the translocation of β-catenin to the nucleus and Wnt/β-catenin pathway activation . To verify whether Wnt/β-catenin could regulate ABCB1 mRNA levels, we modulated the canonical pathway in CML cell lines. We demonstrated that activation of β-catenin signaling by LiCl treatment resulted in increased ABCB1 mRNA levels in both cell lines, with higher levels observed in K562 cells. As discussed previously, K562 cells exhibited less β-catenin binding to the ABCB1 promoter than Lucena cells. ABCB1 mRNA levels were not altered significantly in Lucena cells, suggesting that these cells exhibit saturation of the Wnt pathway. By silencing the pathway using a siRNA approach with WNT 1 and β-catenin knockdown, we verified the opposite—a significant decrease in ABCB1 mRNA levels in Lucena cells—indicating that when Wnt/β-catenin signaling is downregulated, ABCB1 transcription is also downregulated. ABCB1 gene promoter presents seven TCF binding sites that have been until now poorly investigated in the regulation of gene transcriptional activity in cancer cells. However the more proximal TCF binding site have already been demonstrated to be functional in some cancer types see references [13–15]. In this study we could demonstrate that all the seven TCF binding sites are potentially functional (supplementary material) and moreover we showed that two of them are functional in vivo. Transfection experiments suggest that TCF binding sites can function in combination to enhance transcriptional activity. These findings suggest that the canonical pathway of Wnt signaling regulates ABCB1 in CML. Several studies have demonstrated that quiescent CML stem cells do not undergo apoptosis even in the presence of high-dose or more potent TK inhibitors. Moreover, seminal studies demonstrated that a quiescent population of CML stem cells with BCR-ABL kinase domain mutation that is detectable before the initiation of IM therapy gives rise to leukemic cells that persist after treatment see references [1–7, 49–52]. These findings suggest that CML stem cells contribute to CML persistence and disease progression. A question to be further addressed is whether ABCB1 is also regulated by the canonical Wnt pathway in CML stem cells, as this pathway has also been correlated with self-renewal. CML stem cells and normal hematopoietic stem cells (HSC) share several characteristics despite exhibiting remarkable differences. Self-renewal is an essential stem cell property, but self-renewal pathway activation has also been increasingly recognized as a hallmark of cancer. Interestingly, HSC and CML stem cells also exhibit increased levels of drug efflux-related molecules such as the product of ABCB1, Pgp and decreased levels of OCT1, a transporter involved in the uptake of IM, rendering them more resistant to drugs [53, 54]. By the data presented in this work, we provided evidence that the canonical pathway of Wnt signalling is involved in ABCB1 transcriptional activation in CML. Luciana Pizzatti and Eliana Abdelhay contributed equally to this work. We thank Dra. Vivian Rumjanek (Departamento de Bioquímica Médica, Universidade Federal do Rio de Janeiro, Brazil) for providing the Lucena cell line. This work was supported by FINEP, FAPERJ, CNPQ and INCT of Cancer Control. SC performed the experiments, statistical analysis and drafted the manuscript. RB participated and assisted the electrophoretic mobility shift assays and Luciferase experiments. BR participated in flow cytometry experiments. MTLCB performed immunofluorescence assays. LP and EA made substantial contributions to the study conception and design and critically revised the manuscript for intellectual content. All authors read and approved the final manuscript.